This site is dedicated to sharing and teaching others about the opportunities and beauty of The Great Outdoors. Our passion for the pursuit of wild game and being a part of God's creation has given us many experiences and memories we want to share. When it is possible, we want to share what we have learned and show you many of our actual experiences through word, pictures and video. We enjoy introducing young people to the outdoors and actively seek parental involvement as well. This website will share ideas and experiences that we hope will make you want to become more involved in some type of outdoor activity or adventure. Our country has so much to offer and you don't have to go far to find adventure. Let us help you and maybe you will see us in your "Neck of the Woods" real soon! The Lowndes County 2017 Turkey Class was held Saturday March 4th at Marco's Pizza. The kids and adults were treated to pizza for lunch and everyone learned a few facts about turkeys and turkey hunting. There were plenty of experienced hunters and volunteers to share knowledge about calls and calling techniques, turkey biology and habits, and more. The local Georgia DNR was there to talk about gun safety and the proper use of guns while in the field. After lunch the kids were given the chance to shoot a shotgun, many for the first time ever! We appreciate the volunteers that helped the kids handle the firearms safely and responsibly. We hope everyone has a safe and successful season! The 2016-2017 Georgia Hunting Seasons and Regulations Guide is now available online and in print, announces the Georgia Department of Natural Resources’ Wildlife Resources Division. Special opportunity turkey season: The Georgia General Assembly passed legislation directing the Department to establish a special opportunity turkey season for youth (16 years of age or younger) and mobility impaired persons. Wildlife Resources Division office or call Hunter Services at (770) 761-3045. 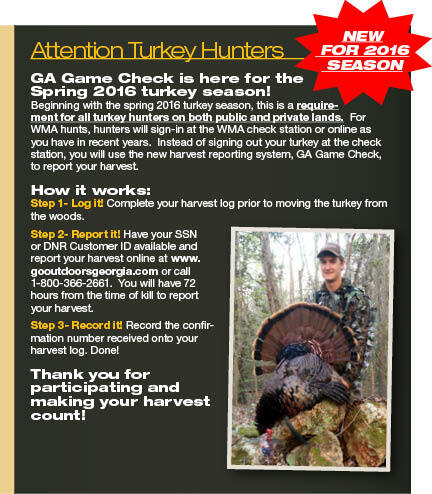 ​GA Game Check begins for the 2016 Turkey season. ​See Major Changes for details. Only for youth 16 years of age and younger and mobility impaired persons (i.e. confined to wheelchair, hemiplegia, monoplegia, paraplegia, or single-leg amputation above the knee). Such hunters must be accompanied by an adult (18 years or older) who may call but may not take or attempt to take a turkey. This season does not apply to public lands unless otherwise specified. Our YouTube Channel is Neck of the Woods OA and it has our current upload of outdoor videos. Click on the button to go directly to our channel.